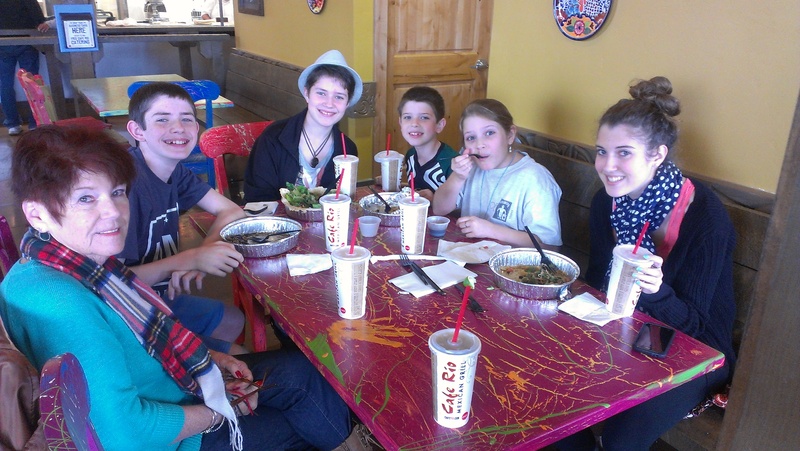 My mother in law has been in town for this past weekend, and in an effort to get out of the house with all of the kids yesterday, we piled all five kids in the car and drove to Cafe Rio for lunch. After a fantastic lunch (have you seen the copycat recipe I posted yesterday?? ), we drove to Five Below, where I needed to make a receipt adjustment, and where we can always find things to fill our cart. We finally made it back to the car, with just enough time to drive home to get KitKat changed and off to work. And the car wouldn’t start. 30 minutes later, after consulting with several people (we happened to be parked next to an auto parts store), we gave up. We decided to walk a half mile to the nearby theater and catch a movie until Dad could meet us to try his hand at getting the car to start. But we weren’t exactly dressed to spend 30 minutes outside. We headed back to Five Below, stocked up on hats and gloves and a few scarves (and one fleece jacket for a certain 8 year old who had escaped the house in short sleeves) and walked the distance to the movie theater. This morning, we donned our hats and gloves to recreate the scene next to our van before taking Nana to the airport. Despite the fact that we weren’t overly thrilled about the circumstances, we ended up having a fun adventure. What a way to end the year! Are you playing along with Wordful or Wordless Wednesday today? Link up! Want to grab my button? © 2013, Food Fun Family. All rights reserved.